The built-in Camera app on the iPhone 3GS does an OK job of capturing video, so why would you want either of these apps? Well, if you want to adjust lighting and audio levels, zoom in and choose among a wide range of special effects, then you need Qik Video Camera Pro. If you like to share videos on the Web, then both Qik apps provide far more options than the built-in Camera app. The newly announced iPhone 4 promises an improved camera with more features, but if you’re not willing or able to upgrade at this point, both Qik apps offer a low-cost way to augment what you already have. And, if you happen to have an iPhone 3G or—heaven forbid—an “ancient” original model that won’t shoot video, both Qik apps will let you shoot video like your 3GS- and iPhone 4-carrying friends. Live Video: Both Qik Video Camera and Qik Live offer a live streaming feature that uploads videos automatically from your phone (though picture quality is reduced to speed up upload times). When I upgraded to the iPhone 3GS, I handed over my original iPhone to my wife. Although it was quite an upgrade from her previous “dumb phone,” she was disappointed that she couldn’t use her iPhone to shoot videos of our dogs that she could then post to Facebook. With either one of the Qik apps, she doesn’t have to wait for my 3GS hand-me-down. I was skeptical at first, but found that both of the Qik apps work remarkably well on her iPhone. Of course, video quality is better on my 3GS due to its higher-resolution camera, but I was still impressed with the results on the original iPhone. And my wife is happy, which is all that matters. Both Qik apps provide numerous ways to share your creations with your peeps. You can create an account on Qik’s Website where you can upload your videos (including location data, if you want), and you can post your videos to Facebook, Twitter, and YouTube. While Qik Video Camera provides some video recording effects that its sibling app lacks, Qik Live goes a step further on the social side by providing direct links to Blogger, Wordpress, Tumblr, and many similar sites. Also, both apps provide an interesting feature called “live streaming.” With this option enabled, your videos are uploaded automatically, though video quality is reduced in order to facilitate faster uploads. For those of you who prefer keeping a tighter reign on your recorded lives, videos shared on Qik’s service can be marked as either public or private. And, for you old school types, both apps let you share your videos via traditional SMS or e-mail. Share the Video: Qik Video Camera offers links for posting videos to Facebook, Twitter, and YouTube. The more sharing-oriented Qik Live adds Blogger, Wordpress, and Tumblr links. Of course, not everyone wants to share his or her life online. So, if you simply want direct access to your videos, then steer clear of Qik Live; it’s geared primarily to online sharing. However, Qik Video Camera lets you access the videos on your iPhone directly, either by copying them to your computer over Wi-Fi or by adding them to your camera roll where you can then sync them to your computer via iTunes. 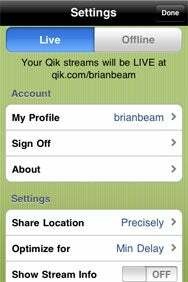 The free Qik Live provides only basic recording features but excels at online sharing. The paid Qik Video Camera links to fewer online sites but offers many special recording effects missing from Qik Live and the built-in camera in older iPhones; it also provides good video quality and direct access to your videos. If you like to share your videos, and especially if you own an older iPhone that lacks official video recording support, either one of these apps is an easy purchase.